What's the Deal with Collapsible Margins? Last week, I ran a twitter poll asking the following question - What would be the amount of space between two sibling divs, where the 1st has a margin-bottom of 10px and 2nd a margin-top of 30px? The result of this poll was that 39% of the 754 people who voted got the correct answer, which was 30px. [CSS Quiz] What would be the amount of space between two sibling divs, where the 1st has a margin-bottom of 10px and 2nd margin-top 30px? 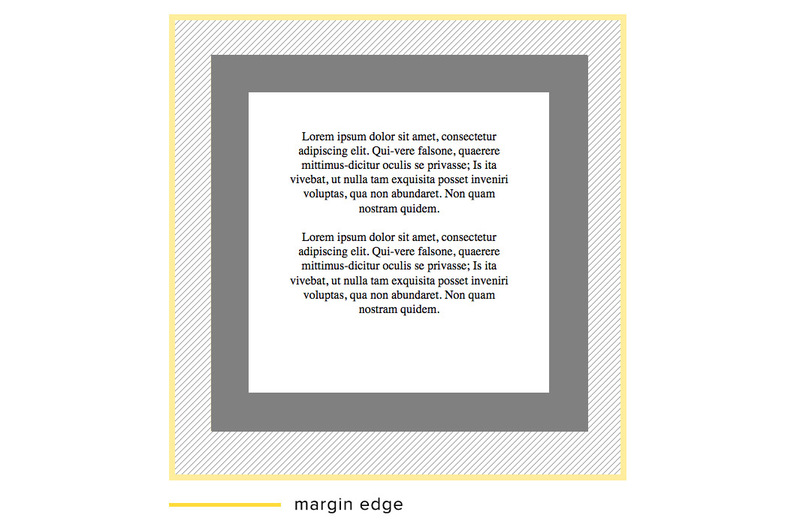 The reason the resulting margin would be 30px was because of a feature of CSS called “Collapsing margins”. Before we get into how collapsing margins work, we need to revisit the box model. As I mentioned in my more in-depth article on Controlling the Box Model, every element in the document tree is a rectangular box made up of four areas - the content area, padding area, border area, and margin area. The margin area is different to the other three areas of the box model because it is not technically part of the element itself. Even if we specify a set margin for an element in our CSS, the actual margin painted on the document can be affected by the other elements within the document, as we will see in the case of collapsing margins. What is a Collapsed Margin? A collapsed margin is what occurs when two block-level elements with meeting vertical margins combine. When this happens, the larger of the two margins (or any if they are equal) is assumed as the single collapsed margin. The margin between the two elements is combined and the resulting “collapsed” margin with a height of 30px is what is left. If a top margin is applied to a parent element as well as it’s first in-flow child, those margins may be collapsed together. Similarly to the first example, margins may be collapsed if both a parent and last in-flow child have a bottom margin. However, unlike the top margins, bottom margins will only collapse if the parent has a computed height of auto. This is the scenario I mentioned in my poll. If we have two elements, where one has a bottom margin and the second in-flow sibling has a top margin, those margins may be collapsed. Finally, both the top and bottom margins on a single element may collapse if the element has a computed height of 0, i.e. if it is an empty element. As with everything, there are a few exceptions to take note of for when margins will not collapse. Collapsible margins only apply to block-level elements. These are elements that have either of the following values for the display property: block, list-item, or table. Therefore, flex items, grid items, absolutely positioned items, and other non-block-level elements do not apply. The margins of the root element’s box will never collapse. In the example cases mentioned above, collapsing will not happen if there are line boxes, clearance, paddings, or borders, that stand between the two elements. Let’s take the first example I mentioned, where the top margin of the parent is collapsed with the top margin of it's first child. If we add a border around the parent element, the margins no longer collapse. This happens because the margin of the parent is no longer in direct contact with the margin of the child. Collapsible margins can be a pain if you don't properly understand when they occur. The first step to dealing with or avoiding them is understand exactly which case of collapsible margins we are dealing with. Collapsed margins that occur because of empty elements or parent/child relationships can't really be avoided. The only way to counteract collapsible margins that occur this way is by inserting something between the elements, for example a border. Otherwise, changing the element's display status to something that is not block-level would be an option. Collapsed margins that occur because of adjoining sibling elements, on the other hand, can be avoided with a change in CSS writing style. Personally, I prefer to follow Harry Roberts' rule of Single-direction margin declarations, which has other benefits besides helping to avoid collapsible margins.